We are just back from an unplanned road trip from Durango to Scottsdale / Phoenix. What a fantastic week of spontaneous discoveries! Our normal trips are 75% planned with reservations booked, and then 25% “Hey, that looks cool! Let’s stop here!” On this trip we made only two reservations for lodging. The rest was a journey of being in the moment, taking new roads and loving the freedom of waking up and deciding what to do each day. 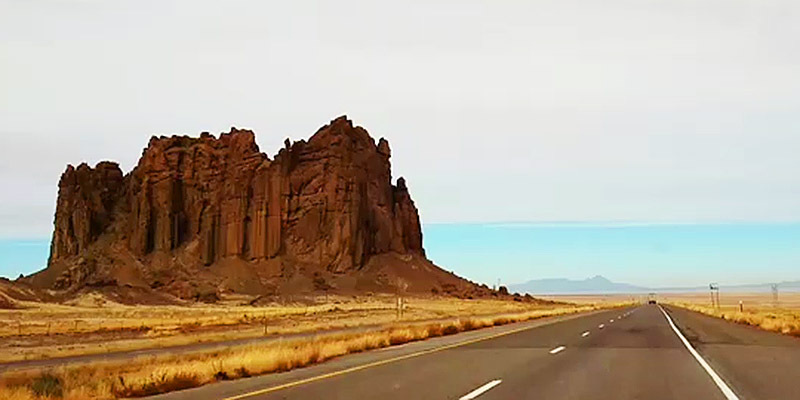 Our route took us south through Shiprock, New Mexico, to Gallup and westward on I-40 (old Route 66) to Holbrook, Arizona. Along the way we stopped to take landscape photographs because the area through the Navajo Nation is a place of magnificent, remote beauty with buttes, monadnocks, mesas and wide open skies. Do you ever drive past a nostalgic, artsy or quirky looking place and think “next time we’ll stop?” This time was next time. 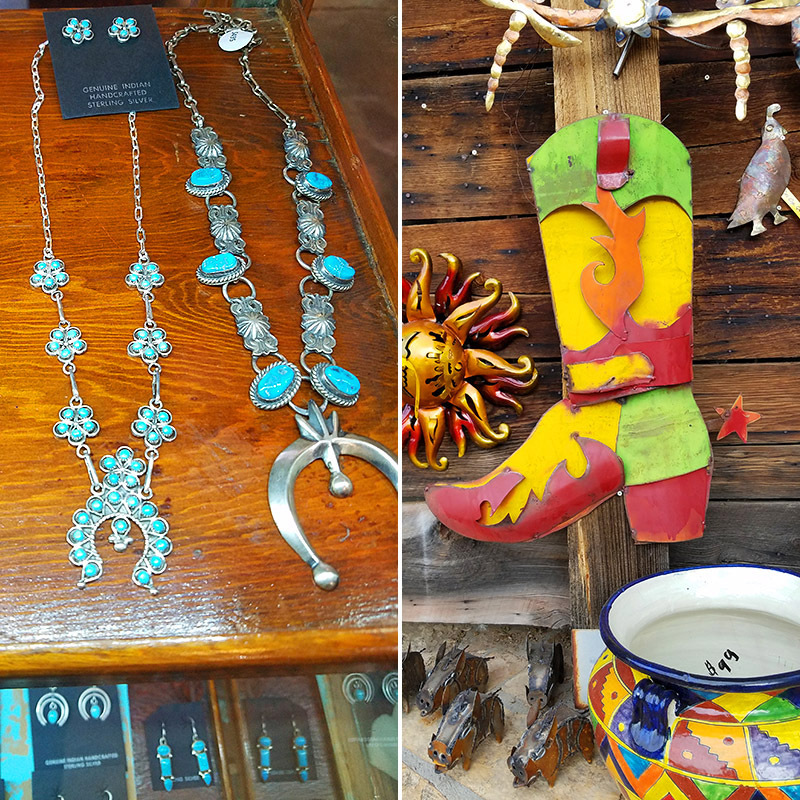 The southwest is full of trading posts and shops that offer souvenirs, local art, items specific to their region, and a boatload of trinkets (some imported so look for tags if you’re wanting authentic local merchandise.) On our stretch along The Mother Road, there were many. 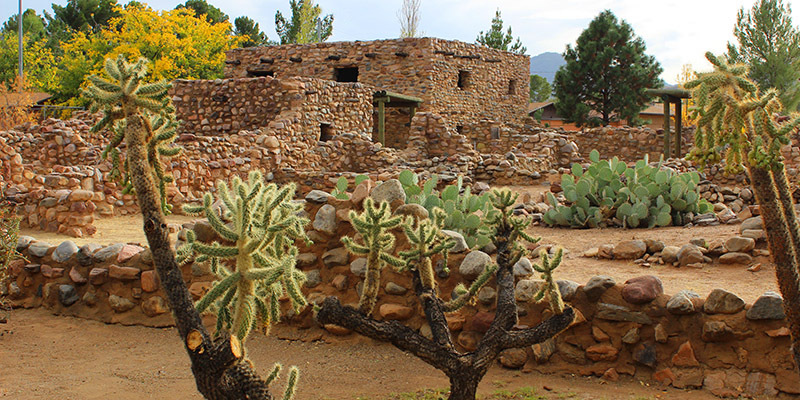 One of our favorites was the Geronimo Trading Post just 7 miles west of Holbrook. 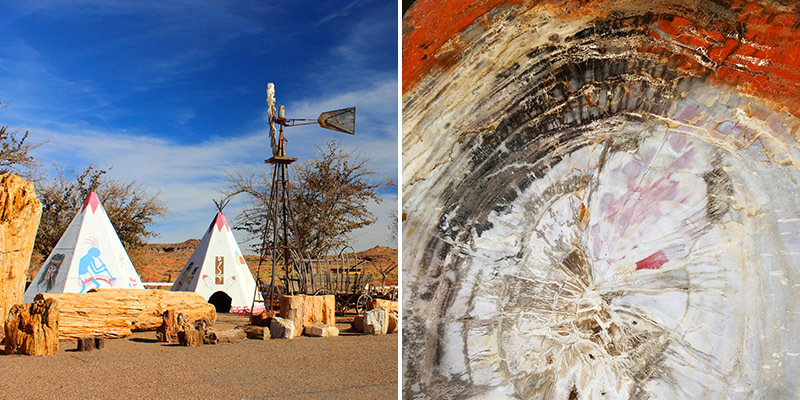 Located close to Petrified Forest National Park — if you’re looking for petrified wood side or coffee tables, huge chunks for your garden, carved petrified wood chairs or small keychains, inlaid jewelry and souvenirs, they have it all. It’s also not a bad idea to purchase original art by local artists. Many families in the area make their livelihoods from their pottery, paintings, inlaid knives, leather works and countless other art forms. 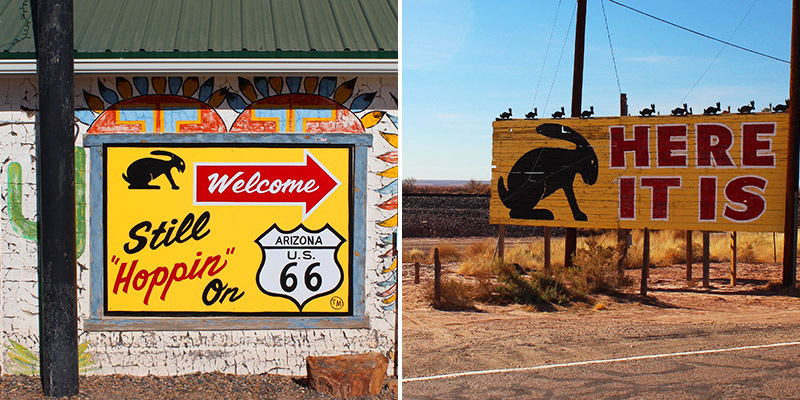 11 miles down the road in Joseph City was the legendary Jackrabbit Trading Post. 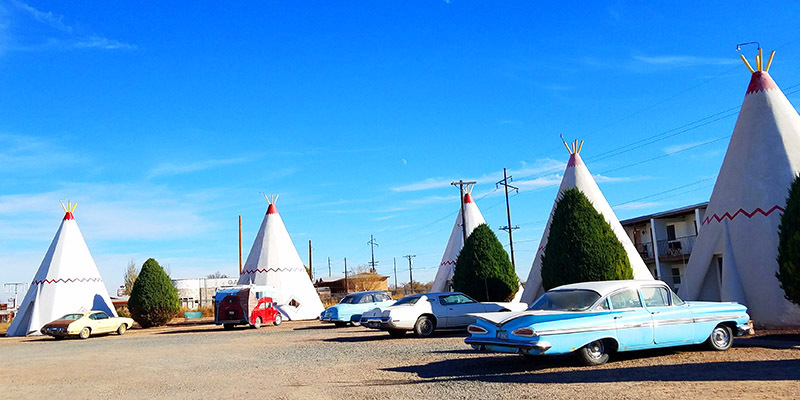 They’ve been there since 1949 when route 66 was in it’s heyday with millions traveling through before the highways bypassed them. We highly recommend the Arizona-made prickly pear jellies at the Jackrabbit that taste like strawberry, watermelon and flowers. We’d stopped in last year to eat at the Turquoise Room and vowed that if we ever found ourselves anywhere near Winslow we’d stay there. 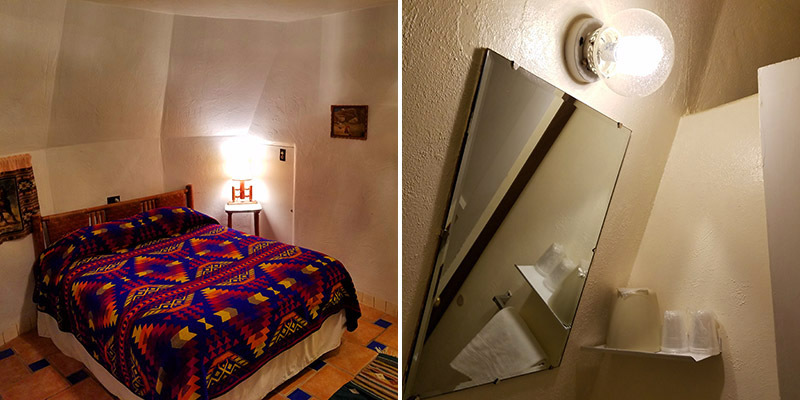 Our room was cozy with southwestern painted furniture and tiles, handwoven Zapotec rugs, and was located right off a quiet sunken garden. 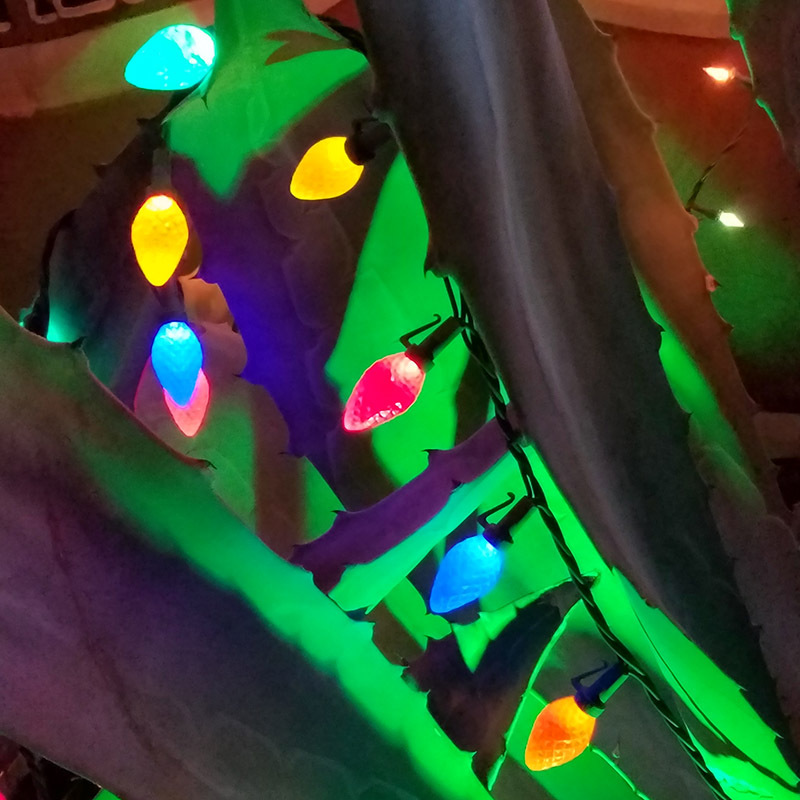 The place was bustling with guests and the staff were busy stringing lights and arranging Christmas decorations — a big project given that La Posada is 65,000 sq. feet including a ballroom. We were so relieved that we had reservations. Even though we were between holidays on an off-week, the place was fully booked. When at La Posada the thing to do is meander. The Turquoise Room is one of Arizona’s finest restaurants with a James Beard nominated chef, John Sharpe. Around every turn of the sprawling hotel and grounds is a unique detail of the Spanish Revival architecture, a sweet garden bench, a lobby with games, chess set, antiques, a piano in the ballroom, huge gift shop (great place to buy Mexican punched tin mirrors, milagros and books), and there is also a museum of owner Tina Mion’s macabre paintings, including Stop Action Reaction, a painting of first lady Jaqueline Kennedy that was acquired by the Smithsonian’s National Portrait Gallery. We suggest making reservations as far in advance as possible, and to ask for a room with a balcony or patio. The Harry Truman room is large with a sitting area (no balcony), and the Howard Hughes Room is the most requested. 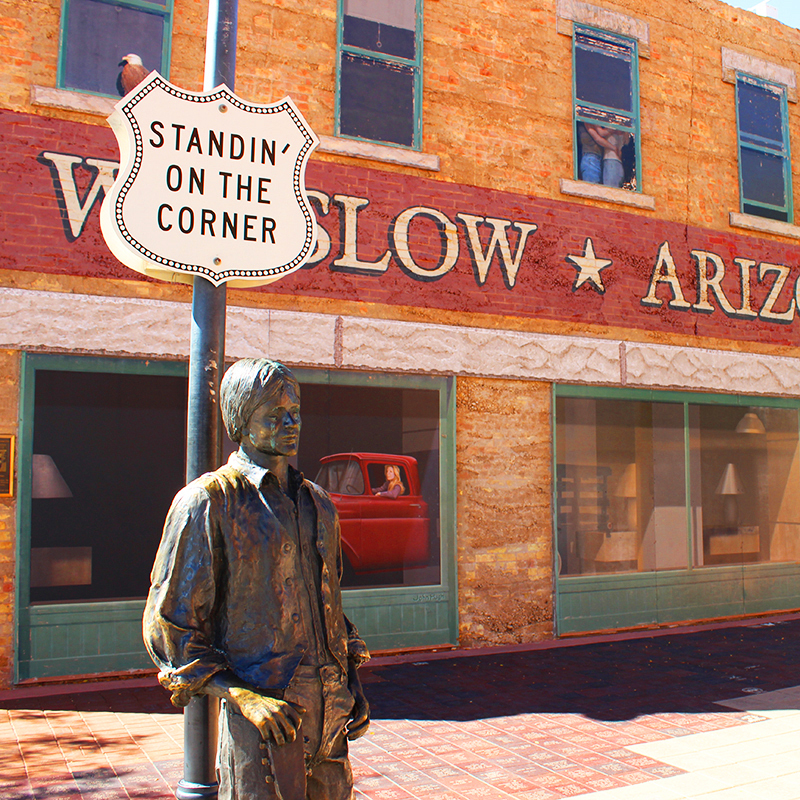 An also must-do in Winslow is to see The Corner. Yep, that corner…. We normally would have left Winslow and driven west to Flagstaff, then south through Sedona to Phoenix. 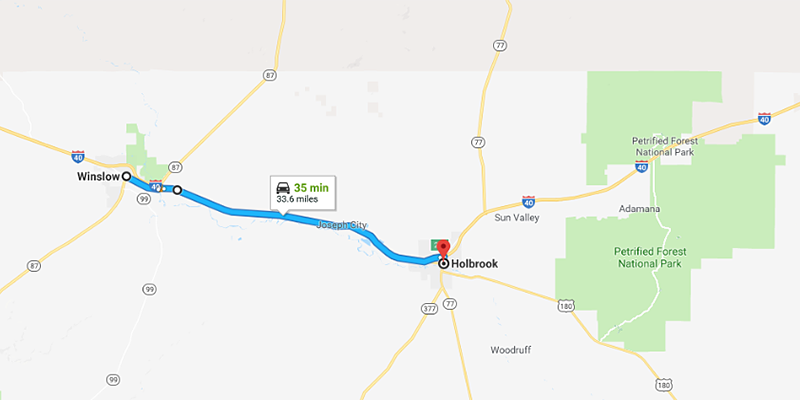 This time we back-tracked east, 30 miles to the small town of Holbrook. As we looked from the highway out to the town Mr.D spotted a group of white teepees along the railroad tracks. We thought it might be a campsite or a boy scouts retreat spot. 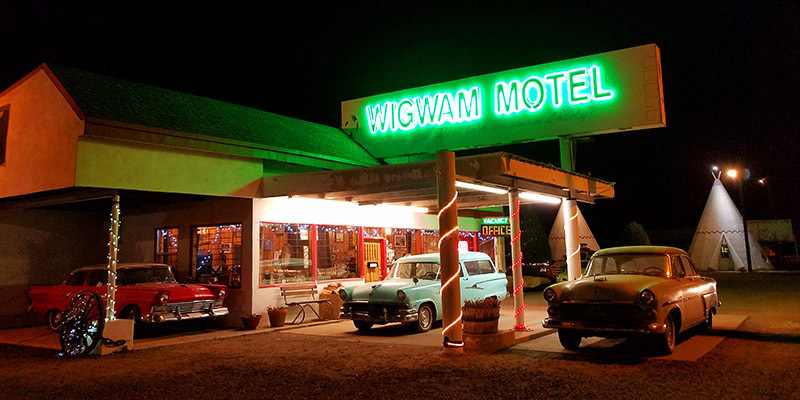 Turns out it was the Wigwam Motel that inspired Sally’s Cozy Cone Motel in the Pixar movie Cars. What a cute discovery! 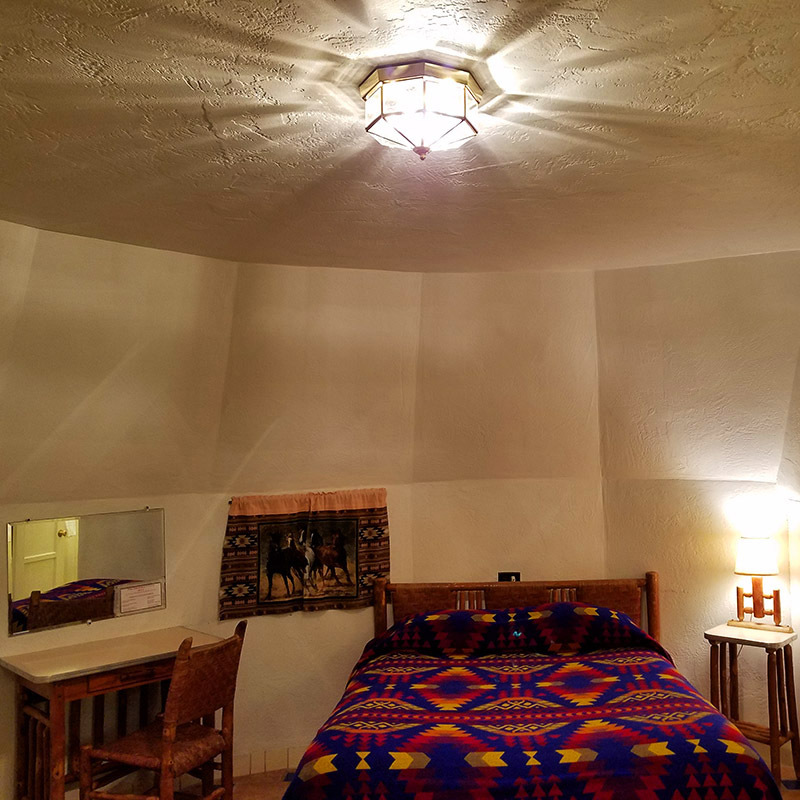 We asked to see one of the rooms and while it was tiny, they were able to fit two beds, a small writing desk, small lamps and headboards (all from the original bedroom set), a TV and air conditioner, and teeny tiny bathroom with mirror tilted down from the cone shape of the teepee. The round room was such a novelty and we couldn’t help thinking of all the people who had stayed there through the years and how amazing it is that they’re still busy and thriving. There are 15 teepee rooms. 1 Bed are $69 per night. 2 Beds are $76. 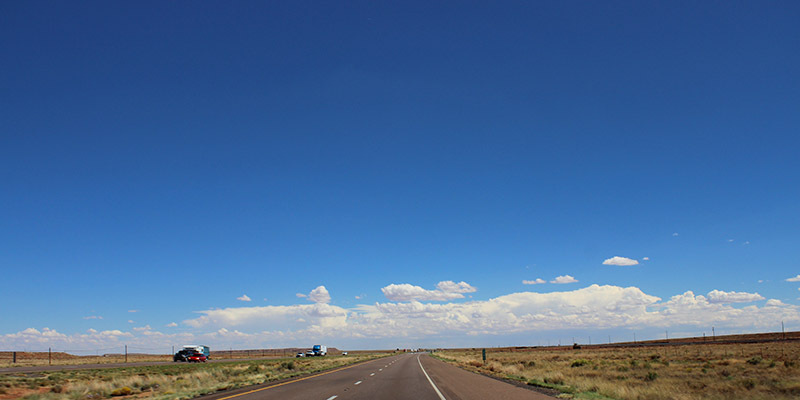 We were told by the manager that they are generally completely booked, particularly in the summer when people travel Route 66 and Mother Road tours come through. Reservations are recommended. In our on-going mission to never eat at a fast food franchise while traveling, we found a Holbrook mom-n-pop diner called Tom & Suzie’s that’s located in an old Pizza Hut building. They’re known for no-frills American and Mexican food, breakfast omelets and chocolate cream pie. The BLT was terrific. FYI — On the trip back we stopped for dinner in Holbrook and had a craving for Italian. After checking online reviews we found one of those highly rated cafes located in a strip mall that hadn’t changed in over 25 years, complete with plastic covered table cloths and original decor. Mesa Restaurante Italiana. For an out-of-the-way small town, this was a find. You won’t get Mario Batali artfully stacked plating or Lidia Bastainich dishes, but you will get an eggplant parmesan made with fresh eggplant, not oily at all and smothered in a rich savory red sauce and melted cheeses. They’re also known for their garlic bread, pizzas and pasta dishes. Such friendly service, we read a review that last year a man had eaten there on his way to Vegas and left his golf hat behind. The next year, per his annual trip, he stopped at Mesa Italiana and his hat was waiting for him. This place is also a local’s favorite. 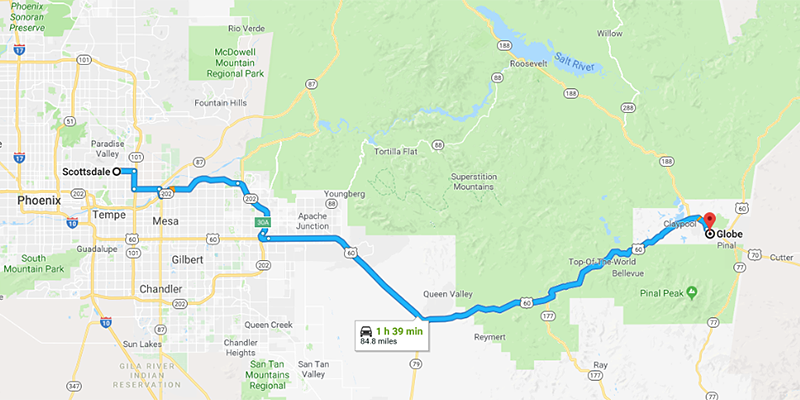 Southward to Scottsdale, we past through Globe, Arizona — the home of the famous (now closed) Sleeping Beauty Turquoise Mine — and made a few notes of places to see on the return trip. 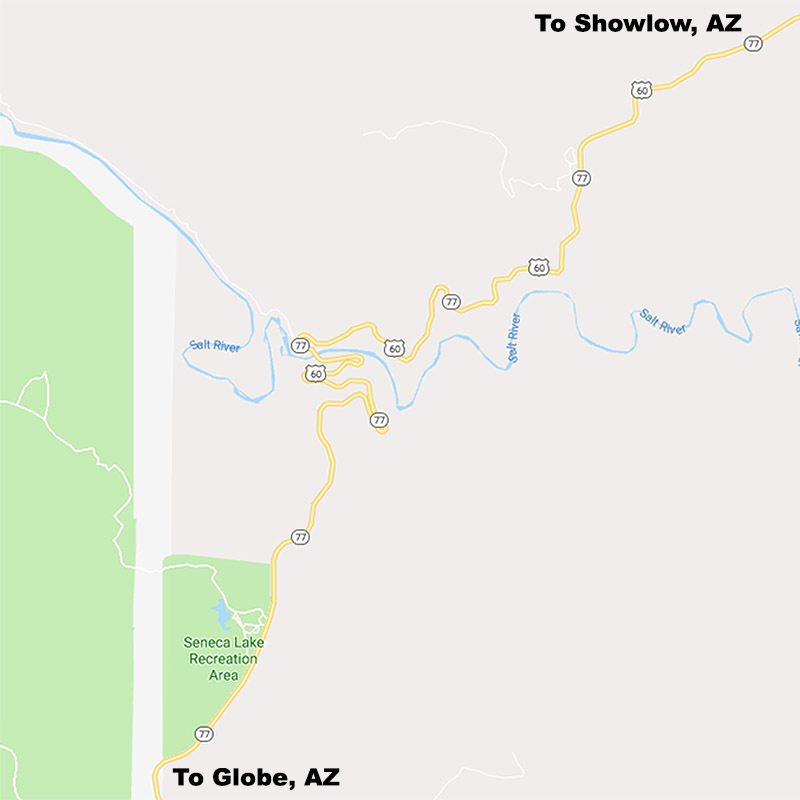 One of the biggest surprise discoveries was the drive on Hwy 60 between Show Low and Globe. 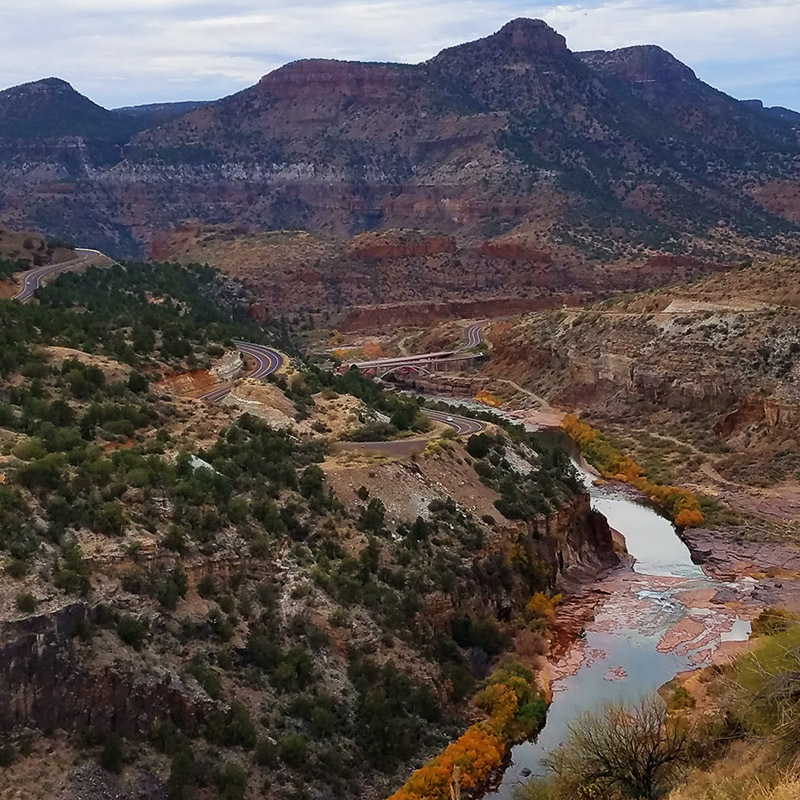 The road twisted and turned through mountains and national forests, and then to the Salt River Canyon Scenic Drive with views 1000 feet deep to the river below. It was like another Grand Canyon! Breathtaking … we stopped at almost every overlook. We’re not really into golf, and most people we asked about the golfing mecca that is Scottsdale / Phoenix knew every course and clubhouse. So, before we left on our adventure we asked around about other must-see places, and then we winged it. It’s important to watch your step, they’re all over the place. If you want them to land on you, wear light colored clothing. And yes they will land on you, brush by your face, check out your jewelry. One gentleman had a shiny earring that caught the attention of a large white speckled butterfly that perched on his ear for ten or so minutes. Then it landed on his arm, circled around and landed on his ear again. He may now be a Youtube sensation, as it was quite a hilarious moment — his reaction was delightful and curious and a dozen or more people filmed him with his new BFF. 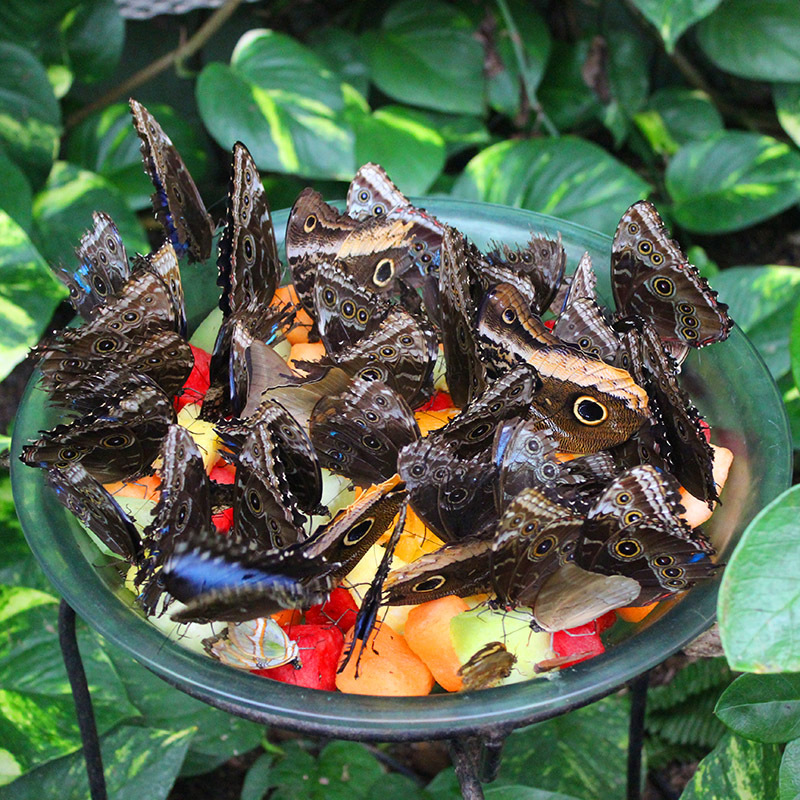 You learn something new every day — these butterflies were taking a snack break of cantaloupe, watermelon and pineapple. Who knew, they like fruit? It seemed to be a favorite spot with a kaleidoscope of flutterbys swarming above and diving in for a seat at the bowl. We were there for two hours — it seemed like 20 minutes. 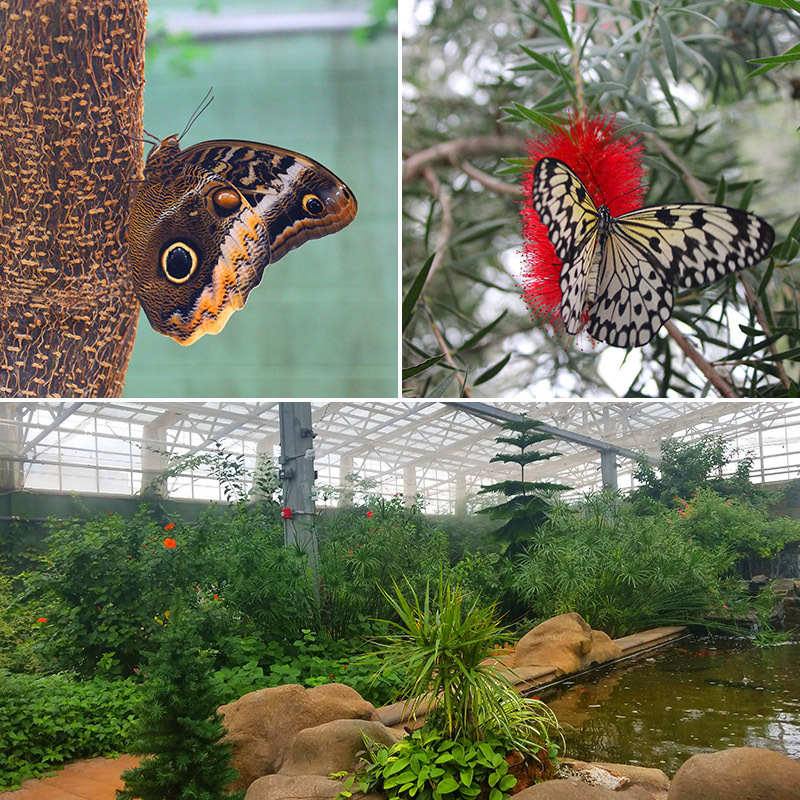 Be sure to watch their 3D movie before you enter the conservatory — the filmmakers did a great job and most everyone in the theater reached out to touch one of the hundreds of butterflies seeming to hover right in front of your face. Also of note, admission is not inexpensive at approx. $25 per person. This is a charming area to walk outdoors, pop into any gallery that catches your eye, shop for fancy schmancy cowboy boots, and follow your nose to one of the many restaurants, bakeries and malt shops. Late November, it was 75 – 80 degrees and we wanted to be and dine outside as much as possible. Again, no plans allowed, so we walked by a large white mission church and noticed a restaurant next door with an outdoor patio. 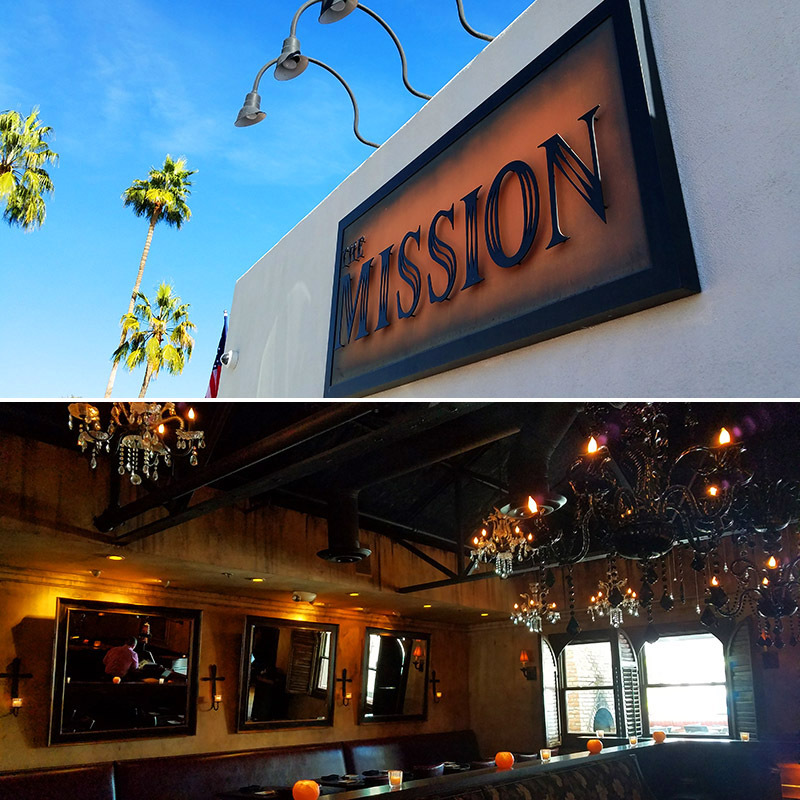 We chose well, this was a stellar discovery and we later learned that The Mission is a favorite for modern latin cuisine. They are widely known for tableside guacamole and we highly recommend it, with only the freshest ingredients custom blended to your taste. So good in fact that a couple at a nearby table had discovered it two nights before and returned that day to have one more wow-guac experience before catching their flight home. We had the Crispy Rock Shrimp Tortillas — lightly beer batter tempura fried with hand pressed tortillas and a spicy rocotto crema. The Tecate Creekstone Skirt Steak Tortillas were perfectly marinated and grilled, with a smoky morita salsa, avocado, lime and cotija. Everything was of the finest quality. Of note, the portion sizes were small so if the guac hasn’t filled you up, you might want to order a fourth tortilla. The margaritas were divine. We tried the Blood Orange and it was smooth, not too sweet and the citrus went nicely with our savory spicy meal. Another favorite — the Cucumber Jalapeno. 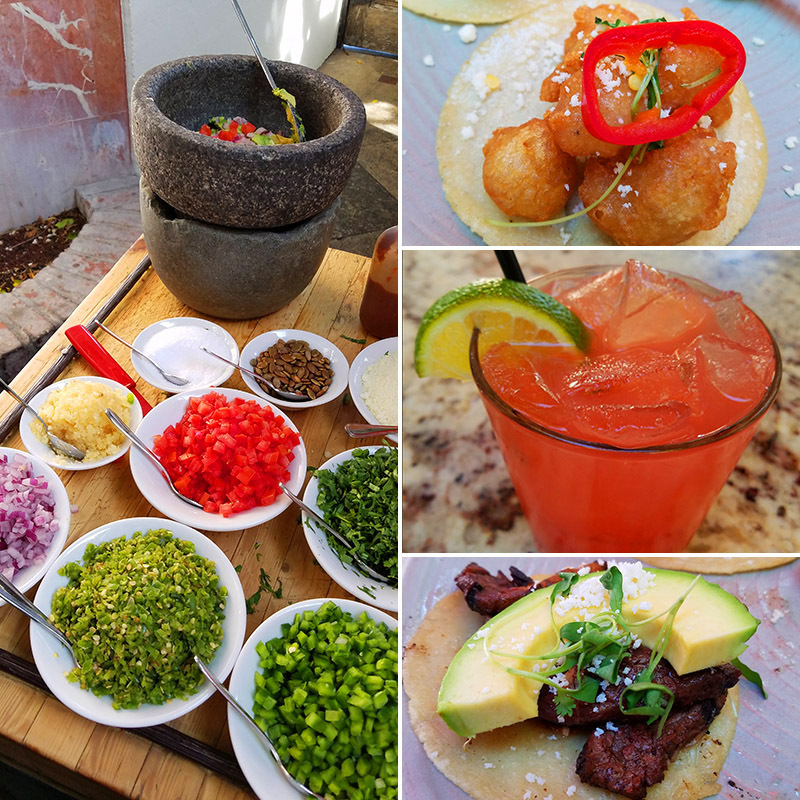 Next time we’ve made a note to try the grilled street corn, short rib barbacoa tortillas and chicken chorizo torta. It was also mentioned to us by several patrons that the dinner menu is exquisite, and the indoor seating is dimly lit and a favorite romantic place for honeymooners and special occasion dates. This endless mall caught Amy’s attention when we drove by and it seemed to go on forever. 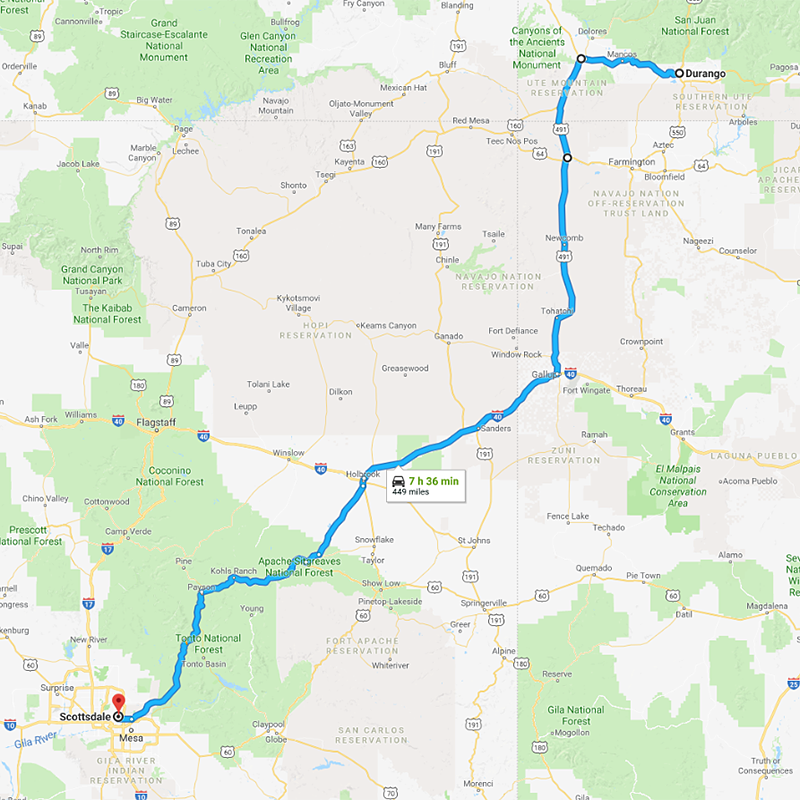 Through a quick google search we learned that it’s the largest shopping mall in the American Southwest with over 2 million sq. feet of retail space. Amy sought out a few favorite stores in a search for Christmas gifts, and of course kitchen gadgets. In the meantime, because for Mr.D being in a mall ranks right up there with spending an afternoon eating organ meats, he checked out the Scottsdale Waterfront. 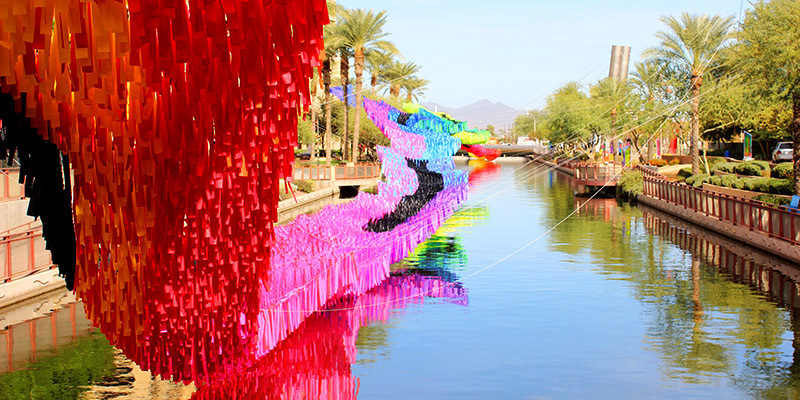 Located between the mall and Old Town Scottsdale, there is a lovely river walk with shops and restaurants on each side. Lit for the holidays, they also had an art installation and this year was Prismatica — with a large bright sculpture hovering over the water creating a mirror image reflection. There were also giant interactive prisms for viewers to spin and watch the colors flash, all along the river walk. 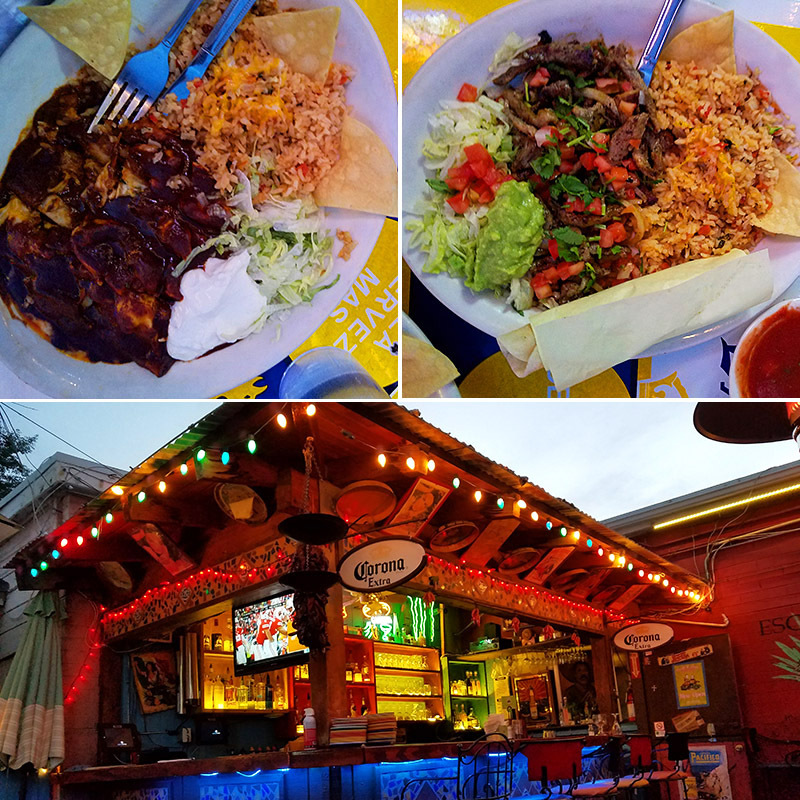 Another spontaneous discovery came about when we had a taste for authentic home style Mexican food, and because it was a warm autumn night we were on the lookout for another outdoor patio. 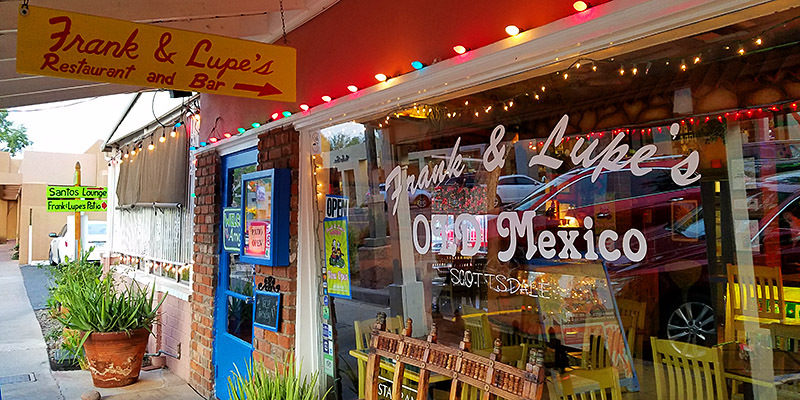 Frank and Lupes “The Best Mexican Food In Old Scottsdale” fit the bill. Our friends Dollie and De Potter (Arizona snowbirds) mentioned this mom-n-pop place before our trip and as we wandered around looking at art galleries, we stumbled upon it. 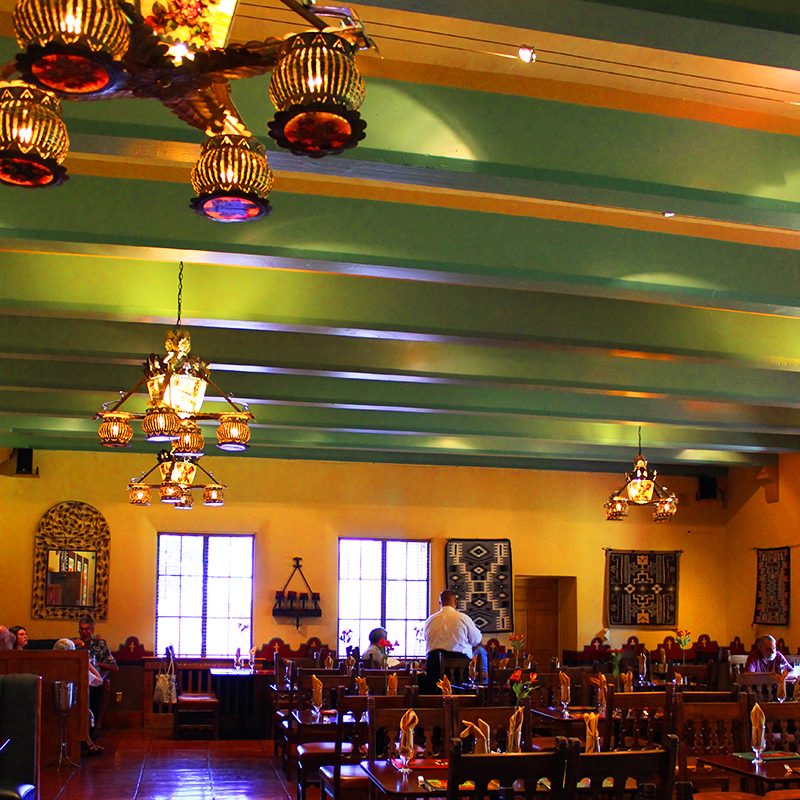 For 25 years they’ve served authentic Mexican from their family’s tried and true recipes. Getting to the patio was a discovery in itself. 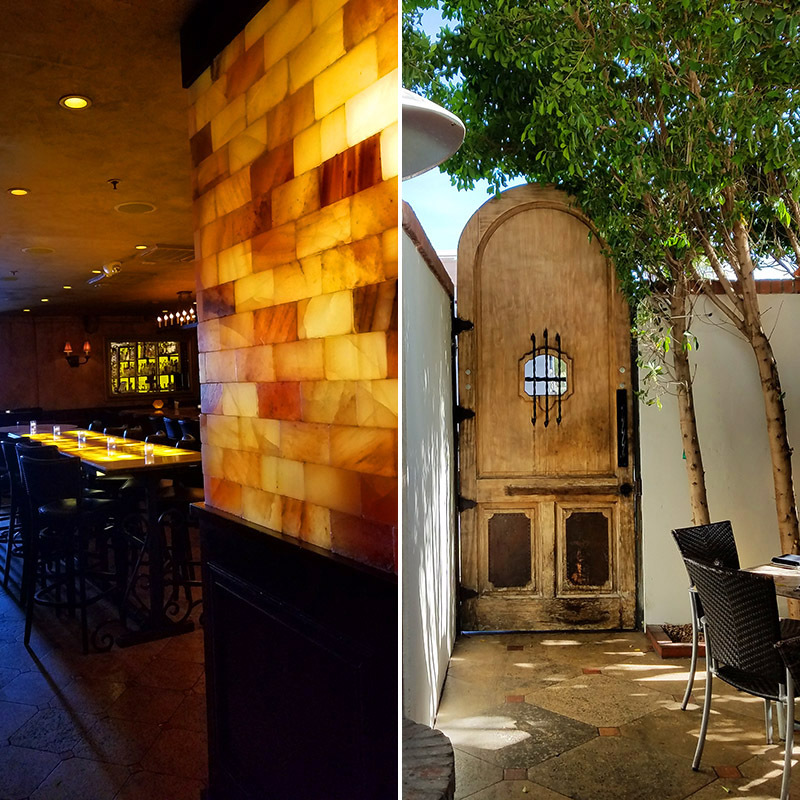 The front dining room staff pointed us to the parking lot, then to the back of the building where there was an outdoor lounge, and then a doorway and tiny alley entrance to the enclosed secret patio complete with bar shack and palm trees. Charming. Intimate. Festive. Packed by 5pm and felt like a friendly neighborhood landmark. We knew it was going to be fantastic when they brought fresh salsa with house made fried tortilla chips. We loved the cheese enchiladas topped with chicken and one of the best, richest, classic savory-sweet mole sauces we’ve ever had. We’d also go back for the well-seasoned steak fajitas with perfect Mexican rice. Another great discovery! 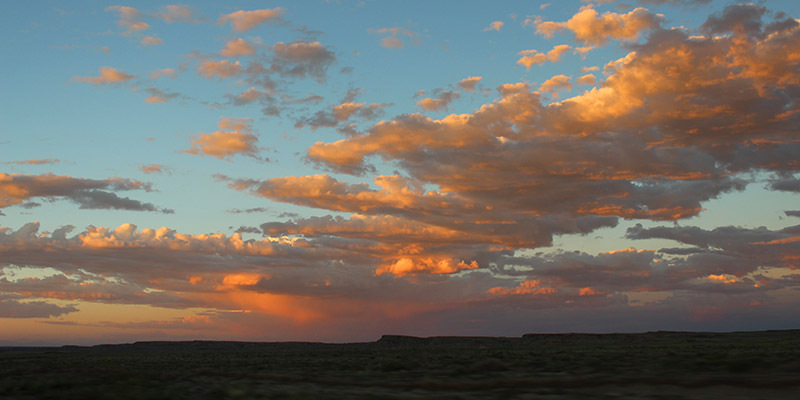 One day around mid-afternoon, we looked up to the sky and saw a layer of clouds that looked to be at the right altitude for one of those amazing color blasted Southwestern sunsets. Then we remembered that Dollie had also mentioned there was a beautiful botanical garden in the area. We drove 10 minutes to eastern Phoenix and as we walked to the garden’s entrance we were immediately struck by not only how well manicured and yet wild the gardens were designed, but the desert plants were of all shapes and sizes and textures. This was an amazing discovery that we could go back to every day and find something new and beautiful. 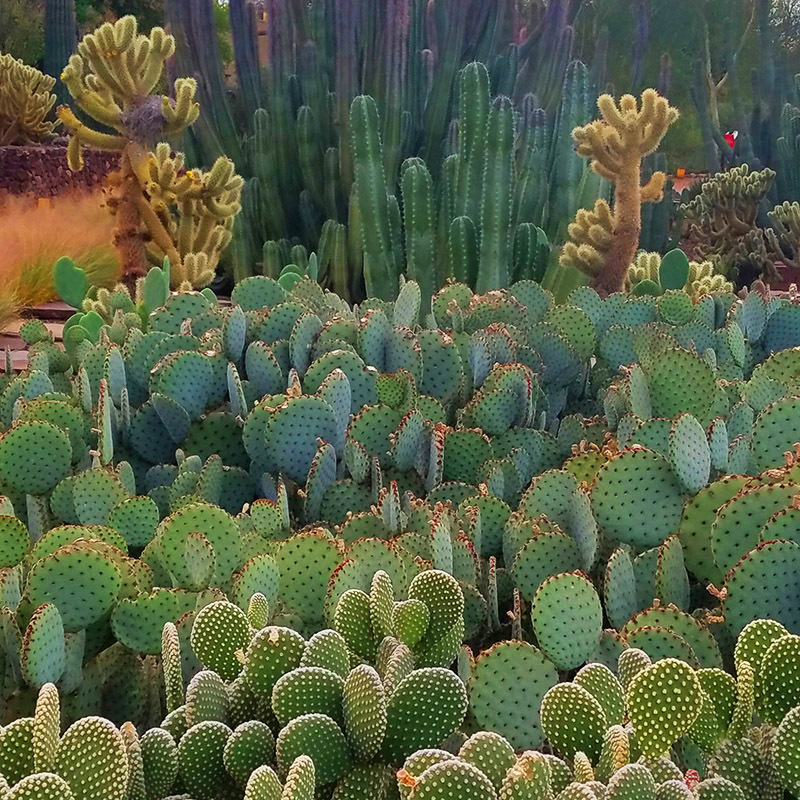 140 acres, tens of thousands of plants, cacti, yucca, agave, many rare and endangered species, all in a meditative design of pathways leading from one exhibit to the next. 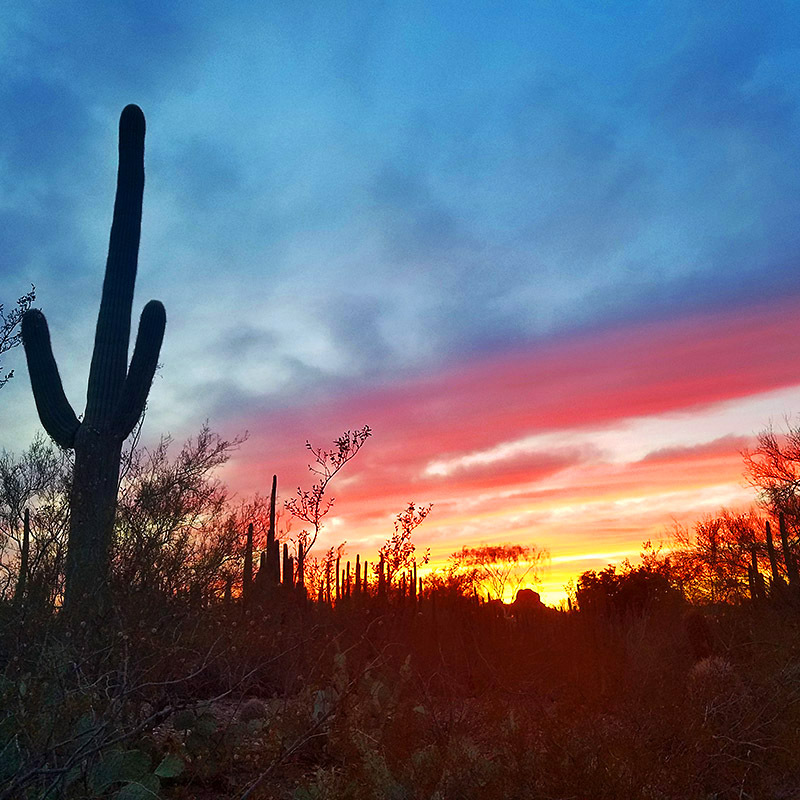 As the sun began to set we were in an area of saguaro cacti when the sky turned technicolor. In that area we were on a hilltop with a perfect view through the giant cacti, and lots of people began to show up for photos so we assumed we’d found the best spot for sunset shots. Above … these were the colors overhead when we sat at the outdoor circular dining room of the garden’s restaurant, Gertrude’s. They offer a fantastic seasonal farm to table menu that is constantly changing. We were craving a light supper and ordered from the small plates side dishes. Everything was delicious, upscale, and mainly regional with duck enchiladas, green chile hummus and elevated stuffed frybread. Have a peek at the scrumptious menu here. On our drive to Scottsdale we’d noticed a huge historic building in Globe surrounded with brightly colored pottery and sculptures. In the spirit of “That looks cool! Let’s stop here!” we discovered The Pickle Barrel Trading Post — 8,000 sq. feet of artifacts, brand name goods, original artwork and thousands of gifts and souvenirs. They also have a jewelry case with gorgeous pieces made with Sleeping Beauty turquoise — that stunning sky blue color from the local mine that is now closed. One delicate, miniature squash blossom necklace caught Amy’s eye. 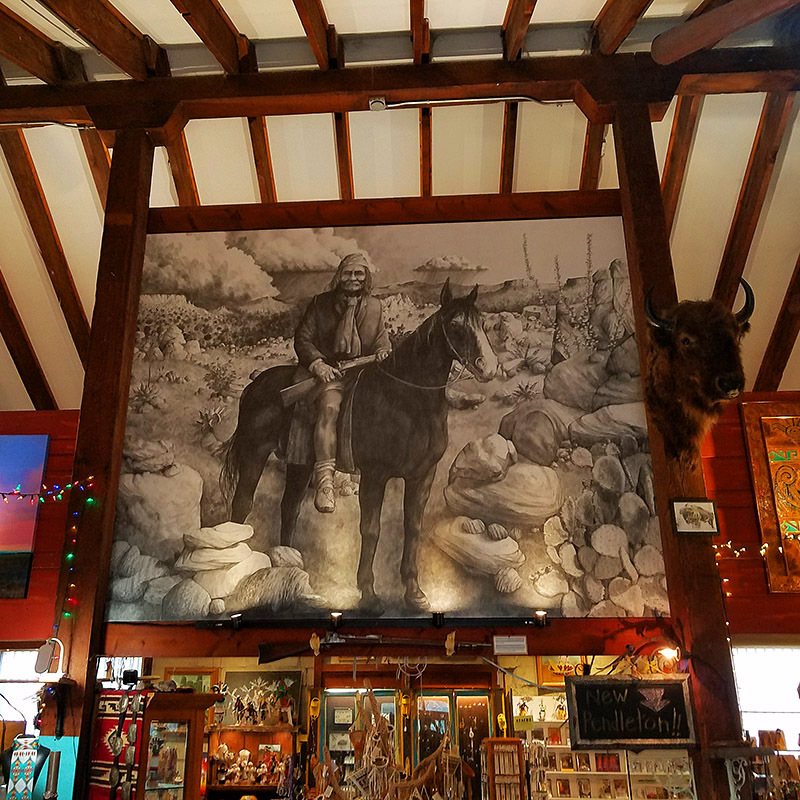 The place was jam packed with southwestern home decor, wall art, candles, buckskin coverings, garden sculpture, books, jewelry, paintings, you name it. Near the front door we looked up to an approx. 8 x 8 foot lead pencil Frank Balaam drawing of Geronimo. The owners told us that this intricate artwork took the artist only 6 weeks to complete. A mighty impressive tribute to the Apache leader. There are two ruins sites we know of in Globe. One is the Tonto National Monument with cliff dwellings, and the other is the city-run Besh Ba Goweh with ruins of the ancient Salado people who built it over 800 years ago. The latter is only 1 mile from central Globe, and was a fascinating discovery. Along with the return drive through the canyons, this was a highlight of the trip home. Easily accessible, we pulled into the parking lot and the ruins were right there, along with the museum. No hiking, no stairs or climbing ladders. Walking through the restored walls and structures, we immediately noticed that they were built from local stones, not the light sandstone from dwellings like Mesa Verde and Hovenweep. The largest structure was open to explore, with metate stones and artifacts to set the scene for what it might have looked like long ago. 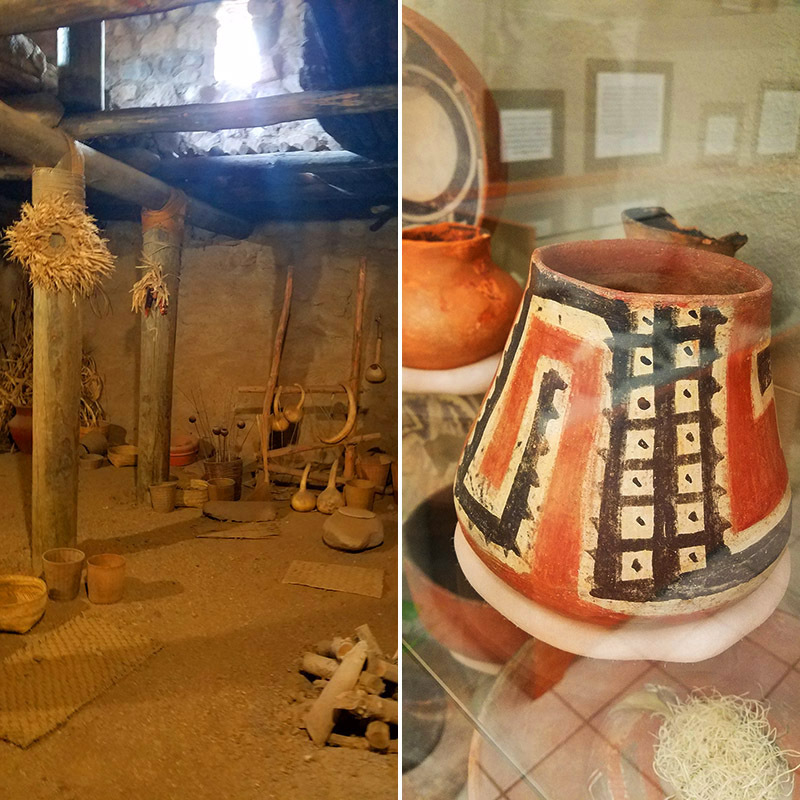 There was also a wonderful museum with well informed staff, an excellent introductory film, and exhibits with pottery, baskets and other artifacts of their tools and artistry. 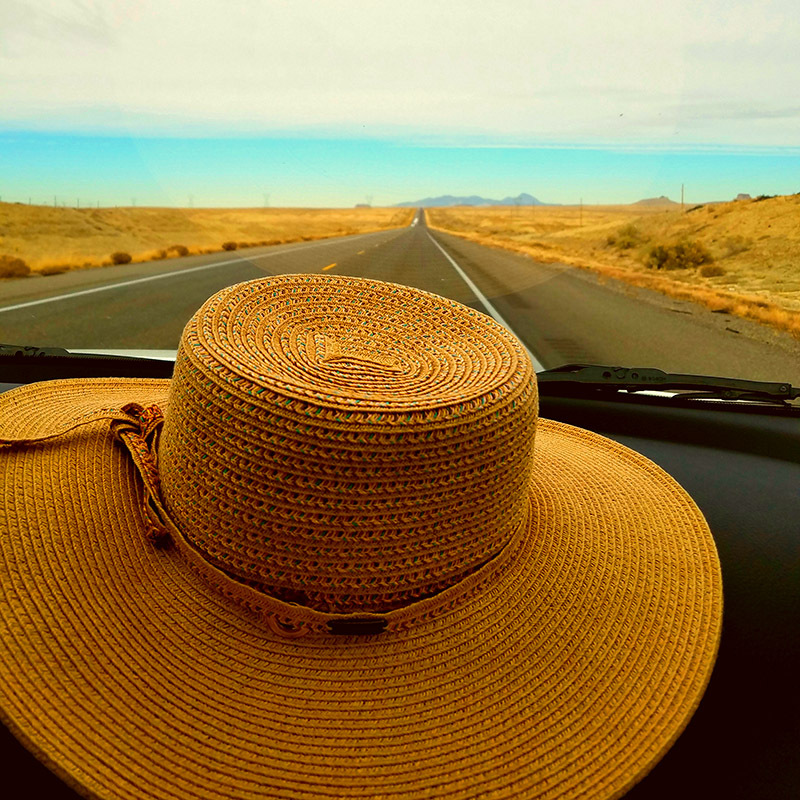 From iconic beauty, nostalgic roadside attractions, gorgeous desert landscapes and gardens, small town charming finds, enjoying mom-n-pop and upscale dining discoveries, new roads and canyons, wide open skies, all from in-the-moment road tripping and meandering. Wishing you Spontaneous Happy Discoveries! P.S. What did we miss? If you have any must-see discoveries for our next trip and tips for our readers please leave them in the comments below. Thanks! Would like to give suggestions for your next trip but had such a great time following along your spontaneous discoveries, I’d rather wait and see where your meandering takes you next. Thanks for the fun ride. Paul, so glad you liked our unscripted trip, glad to have you along for the ride! Dina, we look for foods and venues that keep us away from fast food franchises. Be it fine dining or a roadhouse gem … and the small businesses oftentimes have the most unique charm. Enjoy you guys featuring the spontaneous dining with mom & pop gems and upscale spots. Turquoise room is high on our list. Nice post. Cookie, not having a plan and stumbling upon places can go either way. This trip was one great find after another (with the help of a little google searching on our phones along the way.) Enjoy the Turquoise Room and if you have pics, send them our say to we can share with everyone! What wonderful eclectic discoveries. Thank you! Lisa, glad to have you along for the journey! You two will like the Heard and Phoenix Art Museums. Hiking at the Phoenix Sonoran Desert Preserve. FLW house Taliesin West in Scottsdale. There is amazing shopping to be done in Phoenix. Cafe Monarch Scottsdale is fabulous. Not A Golfer Either, you are cracking us up! Thanks so much for these tips. These are all on our list now and we’ve just looked up Cafe Monarch – amazing! Meandering along with you today was delightful and helpful for when we make our plans. 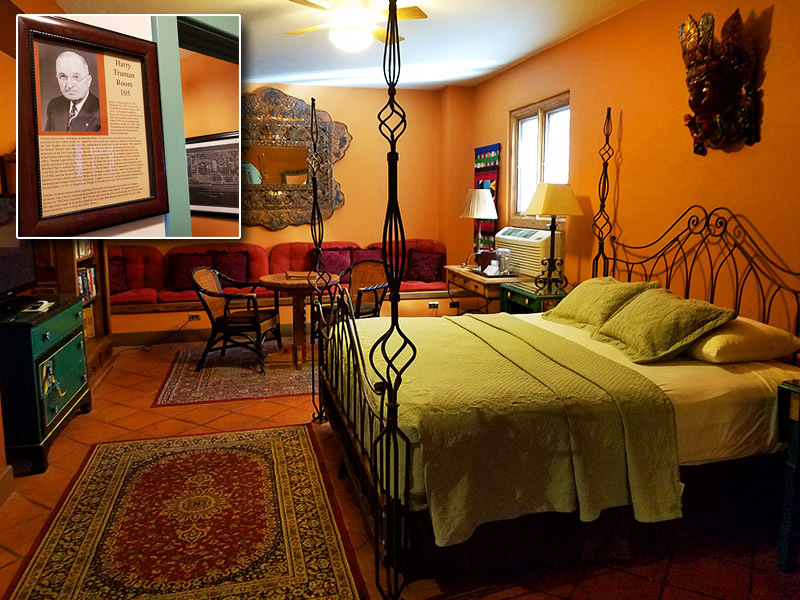 We like the look of La Posada and the Harry Truman room. Also fun to see how the inside of the wigwam rooms are constructed. This was a fantastic road trip and now we’re hungry and talking about driving to Scottsdale for that table side guacamole. Renee, that guac is worth the drive and if you do stop for guac, please send pics so we can share with everyone. 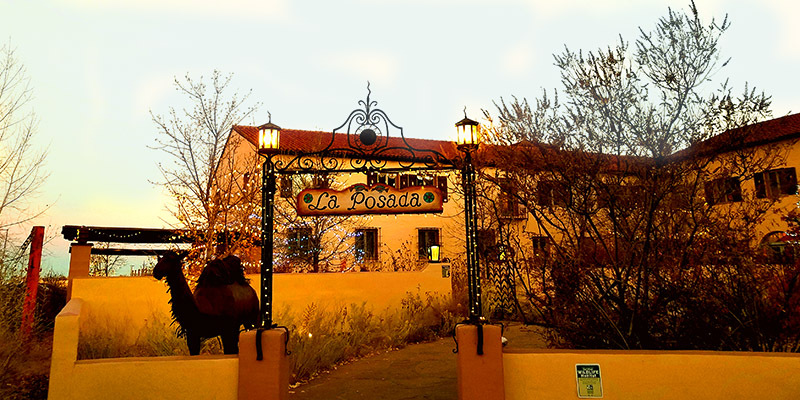 Have a wonderful stay at La Posada! Shannon & Drew, yes we are! vowed to be forever tourists in our own region. Great discoveries! I felt as though I were right there with you for the entire trip. Very nice road trip and I look forward to your next one. Barbara, so glad to have you along for the ride. 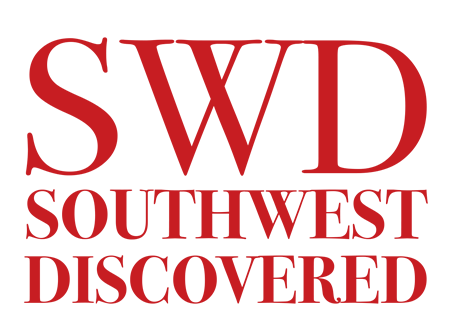 We’re planning our next trip now … so many options in the southwest! I say this often, but this is quite possibly my favorite of your road trips. I can’t count the times we’ve driven past one of those nostalgic old places on Route 66 and not stopped in. In the future we will. Your unscripted finds were so fun to discover along with you. Very inspired by this. Thank you! ChileSage, thank you so much for the kind comment. When you stop at these roadside attractions pls send pics so we can share them with everyone. Obviously your AZ trips are my favorites and I absolutely love that you stumbled upon these places. You did a great job. Nice stumbling! 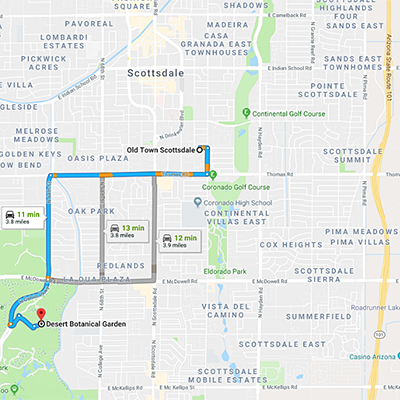 So glad you found the Desert Botanical Gardens and Old Town Scottsdale. 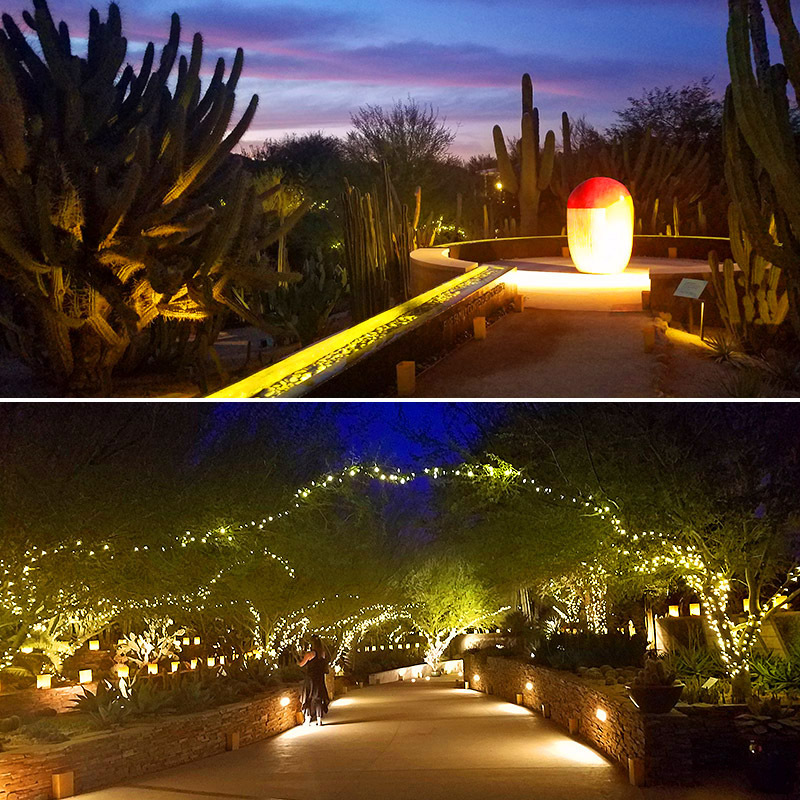 Next time be sure to check out the Frank Lloyd Wright house Taliesin West and there are some amazing museums you will love in Phoenix. Great article. Thank you! AZ, thank you for the tips! We have Taliesin West on the list for next time, and the Heard Museum in Phoenix.